In this lesson, I’ll be going over how to figure out a drum arrangement for a Bon Daiko song. Many good Bon Daiko players – my teacher included – will tell you to sing the song as you play the drums. By doing so, you’ll be internalizing the song, the flow, the dynamics, the lyrics, the feel, etc. That being said, singing and playing at the same time is easier said than done. In this video I’ll be covering some of the steps to get to that point. One of the first things – if not the first thing – you’ll want to be able to do is find and maintain the pulse of the song. Find the tempo and see if you can clap along accurately to the song. Another very useful step is breaking the song into smaller sections. For example, you can take a look at just instrumental part of the song. I’m going to combine these two techniques and clap along to the instrumental part of Hokkai Bon Uta. If you’re feeling comfortable, you can try singing the melody of the song and clapping. If you’re not confident about the pitches, you can start by learning the rhythm. In the beginning I’m just going to clap and sing the rhythm of the song. I can then begin learning the pitches of the song, and eventually I’ll be able to hum the song and clap at the same time. Gradually, you’ll want to start replacing the clapping with Matsuri patterns. I’m going to sing the same part, but instead of clapping, I’m going to play Matsuri pattern 1. And the last step is the play a variety of Matsuri patterns while singing the song. From here, you’re going to rinse and repeat until you get through the whole song. Now, every once in a while, you’ll run into a song where the basic Matsuri patterns don’t fit. For example, Hokkai Bon Uta has a bar of 2 in the middle, so if you continue playing the Matsuri patterns you’ll get flipped around. When you encounter one of these spots in a song, try listening to what the other instruments are playing. 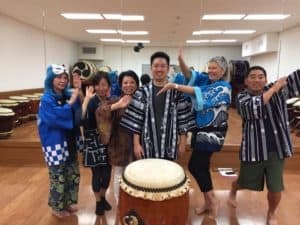 I teach Bon Daiko every Friday night from 8-10PM at Los Angeles Taiko Institute in Torrance, CA. Please let me know when you would like to drop in! I also offer private lessons and online taiko lessons via Skype from my studio in San Pedro. Please let me know when you would like to schedule a lesson! Subscribe to My Newsletter for More Taiko Lessons!